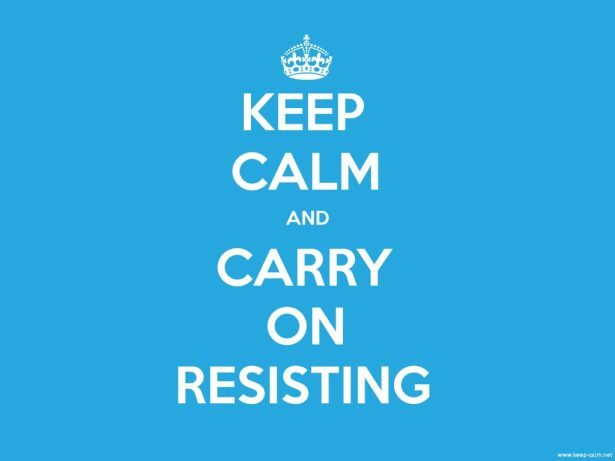 How do we build a lifestyle of resistance, as opposed to just a posture of resistance? Here's what some poets, professors, activists and moms have to say. By now, my inchoate hopes that our nation will just wake up from the bad dream of Trump — or even more remotely that he’ll be impeached by a radicalized Congress — have turned to dust and floated away. He seems here to stay, and I need to figure out how to stay human, stay upright, with him in the White House. I need to be thinking about the long haul, about a life and a lifestyle of resistance, as opposed to a posture of resistance. Zunes is citing the work of Erica Chenoweth, whose research discovered the 3.5 percent rule. This University of Denver political scientist crunched the numbers for every known nonviolent and violent campaign for government overthrow or territorial liberation from 1946-2006 that included at least a thousand observed participants. It is a huge dataset. And she found that when enough people join, change happens, and it happens nonviolently. As Chenoweth said on the TED stage in 2013, “Every single campaign that did surpass that 3.5 percent threshold was a nonviolent one. In fact, campaigns that relied solely on nonviolent methods were on average four-times larger than the average violent campaign. And they were often much more representative in terms of gender, age, race, political party, class and urban-rural distinctions.” That sounds like the kind of people power we need to be building with our resistance! I have a very busy friend who always seems energized and positive. She has two kids, a gaggle of chickens, a sister with special needs and is always doing a million things. Her son and my stepdaughter are in the same fourth grade class. She shared: “I would love to be in my own cocoon, but unfortunately I cannot. So doing good for others, helping a child, advocating for services that may be needed, not complaining but bringing ideas to the table … just realizing that I cannot do it all, but if I and everyone did one good thing [helps me realize] how many millions of good things we can accomplish.” Right on, Claudia Bouchard! Virtual bird watching: That sound like a pretty awesome recharge to me. Other friends mentioned stand-up comedy, water (with or without a lemon slice), daily Eucharist, cannabis, Pokémon Go, taking care of chickens, beauty, helping out in schools or soup kitchens, and sharing meals with refugees. Laura Gross Bandara, another college friend, was really specific, mentioning books that are helping her right now — specifically the writing of women like the recently deceased (at age 100) Detroit organizer Grace Lee Boggs and the American Tibetan Buddhist nun Pema Chodron. She is also keeping these two books — “This is An Uprising: How Nonviolent Revolt is Shaping the 21st Century” and “Braiding Sweetgrass: Indigenous Wisdom, Scientific Knowledge and the Teaching of Plants” — within reach. Laura writes: “I am making sure that I am showing up for face-to-face events, not just doing online and phone activism. Also, honestly, doing puzzles. It helps to focus. Weekly media and Facebook fasts.” I like the seeming incongruity of Laura’s current go-to books and want to know more about how they connect. So, how am I dealing? I am listening to my friends. They are recharging me. I also started running again. It has been helping me find space in my head — breathing in cold, fresh air and blowing out the cobwebs, the knots and the fear. With each footfall, I find relief from the constant flutter of information, commentary, headlines and tweet-storms. In the new rhythm of breath, I am pounding an escape from this inescapable sensation that I am not doing enough — that no one is doing enough — to resist the Trump administration. Ah, well then. A thank-you is not nearly enough. I offer it because reading your page of condensed thoughtfulness, of current and historical wisdom has left me sitting here thinking. The tears in my eyes are because those thoughts are most ardently of hopefulness, of possibility and the chance for a different world. Lately, that has not happened a lot. Why are some people so afraid of Trump? He is no different than Obama. We will not get a change in this country until we realize that our congressman and senators are in office too long We need to change them more often. The longer a person stays in office the more corrupt they become. The dictionary definition of Fascism is rule by corporations. We’ve got that. But it goes beyond that: there is the demonization of minorities and their religion, the exceptionalism, the nativism, the love of rallies, the undermining of all the supports of democracy (the press, the Courts, elections, education, the law, and politics) expansion of the surveillance state (the NSA), the militarization of police, and expansion of the military for empire, but also, as demonstrated in the current budget proposal, the lack of concern for our own people. The fascist state doesn’t care about it’s people (as seen in Germany). In fact, it is not unusual for a controlling elite to make war on its own people as seen in present day Syria. I suspect that as income inequality becomes more extreme, as it naturally does, there is an inevitable rise of poverty that leads to unrest. If the ruling elite ignores the problem, there can be strong resistance, which will be met with force. Thank you. LOVED reading your post and all the suggestions from friendly, kind souls. Much appreciated, especially today. Thank you. Especially for reminding me, also, to resist the notion that I am never doing enough. If we feel pulled too many ways–especially those, like myself, with acute and life-long melancholy tendencies–we cannot function. I am trying day to day to learn the balance between my literary art (does it make any difference if almost no one reads it?) and the occasional comment or letter to the editor of the local or regional paper (do they make any difference, either?). But what has helped the most, and continues to do so, is the contact with friends and, above all, family: the children who still want me to be a part of my life, and the grandchildren who are such a delight and joy. Tomorrow it is to the theater, with one daughter and 13-year-old grandson, to see a university production of Hamlet. I doubt that it gets any better than that…..
Good piece, Frida, glad I found it while searching for you.